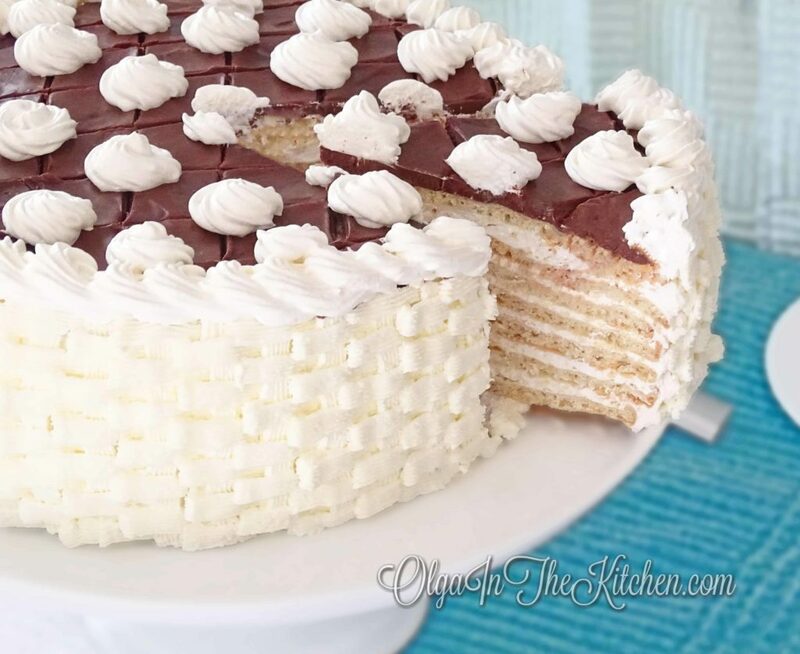 Ammonia White Cake with Sour Cream Frosting: dry cake layers creamed with sour cream frosting, topped with chocolate ganache. An old family favorite! 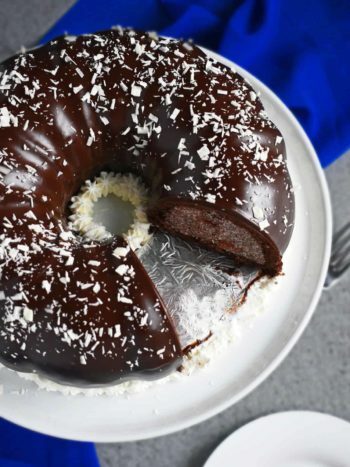 This cake is an old family favorite since Ukraine. This was literally the only cake we ever made. Ammonia baking powder has always been very popular ingredient among Ukrainian bakers and I believe it still is. People use it for dry cake layers and for many many delicious cookie recipes. Back in Ukraine, when we were still little kids, we would bake several of these cakes and decorated with different colored sprinkles for every Easter, Christmas and other major holidays. Baking this cake and the smell of ammonia powder in my home during baking process really brings back my childhood memories. The secret ingredient Ammonia Baking Powder in this recipe can be bought at most or all Ukrainian/Russian, European and Asian markets. Make sure that it’s the baker’s version and not the home one. Sometimes these are sold in bottles and sometimes in little pockets. The recipe calls for 2 tablespoons, which isn’t enough in 1 bottle, but I have tested with just the amount in 1 bottle and it’s also enough. 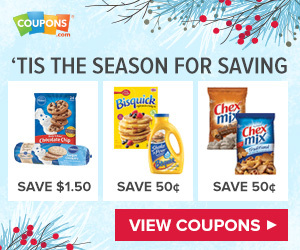 These also come in different brands, but the exact one I usually use, you can see by clicking HERE. 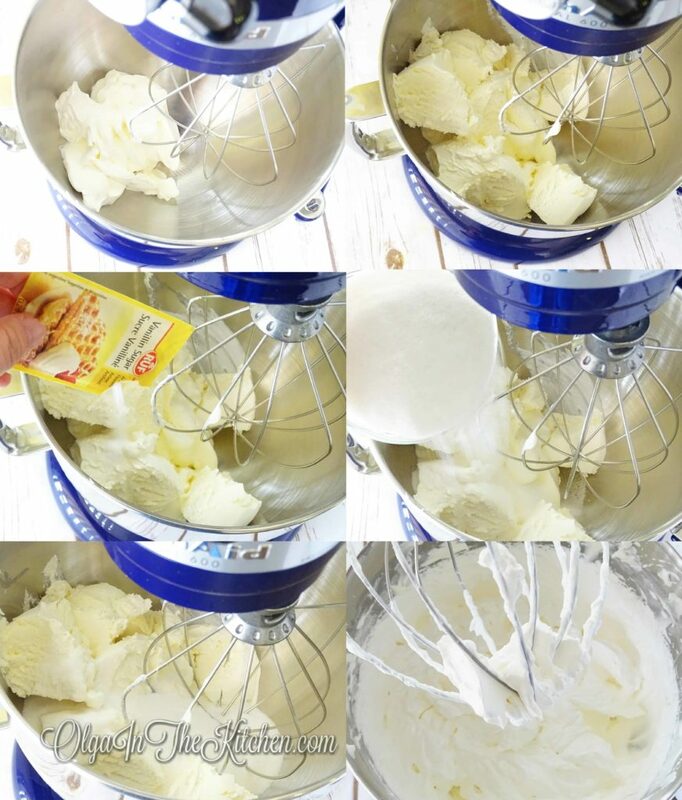 Working with ammonia baking powder: NEVER try to smell it; keep face at least 18” away from the bottle and the dough. The smell will come out during baking process. When you first open oven after each layer is finished baking, keep your face as far as possible so you don’t get this flush of ammonia in your eyes. 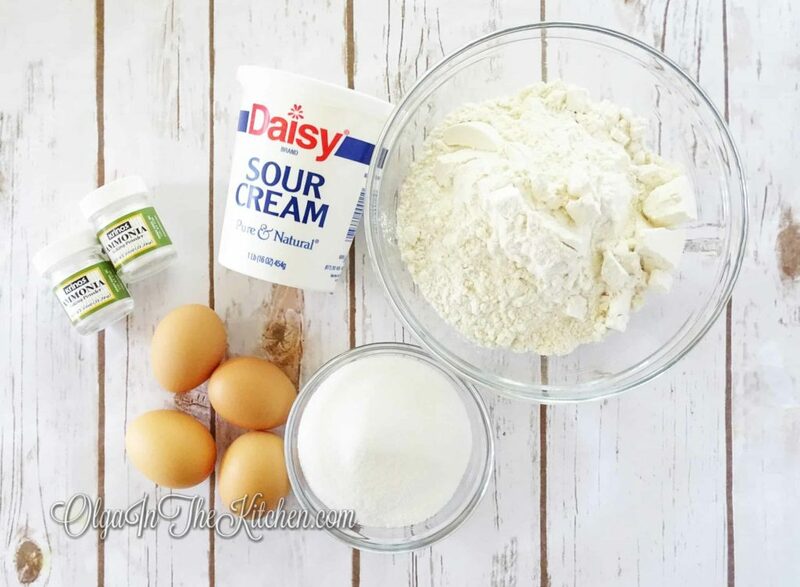 Use Daisy brand for sour cream frosting to get the best results. 1. Preheat oven to 360°F. Lightly oil Springform Pan. In a small bowl, combine and stir 2 tbsps ammonia baking powder and 2 tbsps sour cream (leave other 2 tbsps. for later); set aside while you prep the other ingredients. It will become fluffy and a bit bubbly. (Ammonia baking powder usually has dried bubbles, press it with spoon to make it into smooth powder). 2. 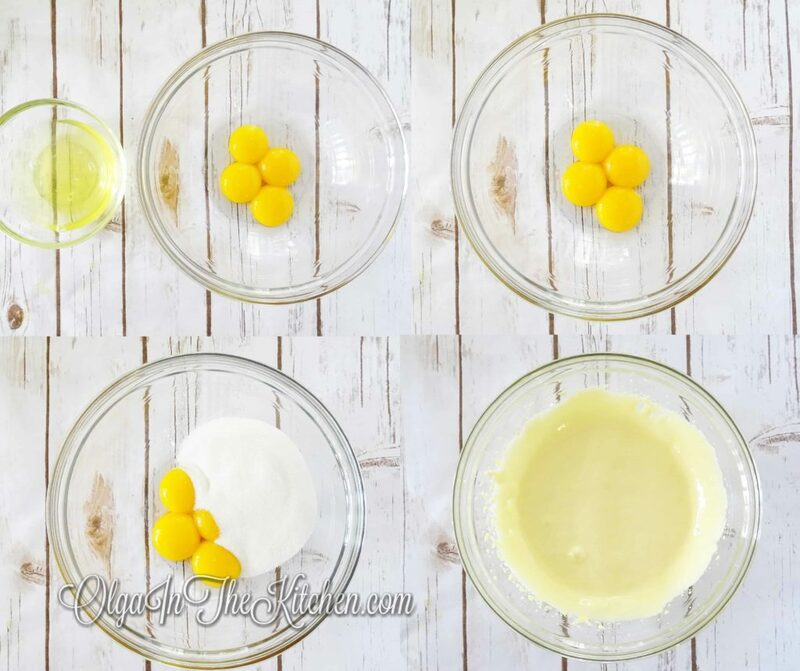 Separate 4 eggs; refrigerate egg whites and use for other recipes or for breakfast. In a large bowl, combine and beat 4 egg yolks and 6 oz sugar for about 1 -1 ½ mins until sugar is dissolved. 3. Add the ammonia baking powder mixture and remaining 2 tbsps sour cream to the egg batter. Beat for 1 minute on high. Start by sifting 1 cup all-purpose flour at a time into the batter, and start by beating on low so you don’t end up covered in flour. When batter starts to come together, continue mixing flour with your hands. I usually end up with 2 1/2 cups all-purpose flour while mixing and then the other 1/4 cup while rolling out each layer. It should represent a cookie dough: not sticky, but together. 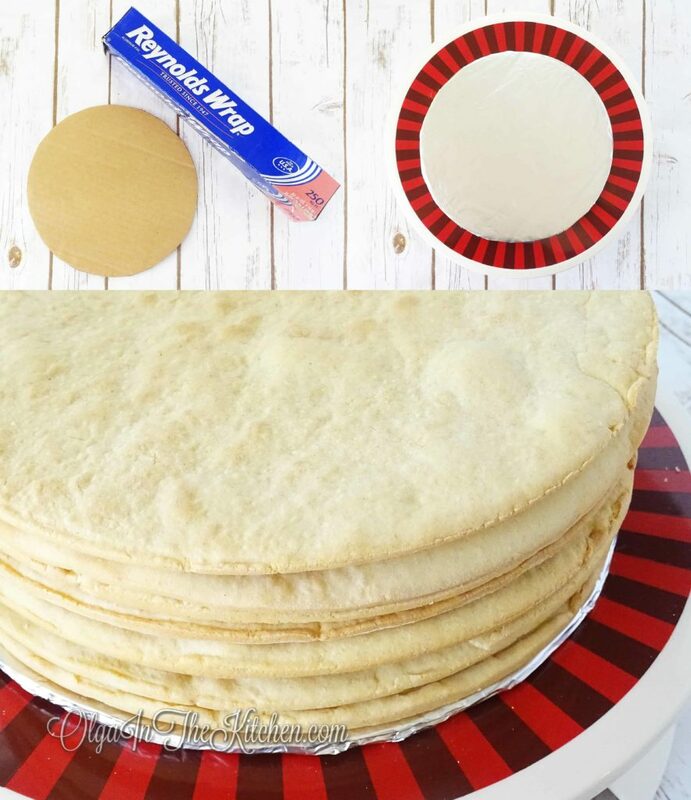 (Don’t make it extremely hard because you will add more flour when rolling each layer). 4. Cut dough into 6 equal pieces. Lightly flour work surface and roll out 1st dough piece to about 2 mm thickness. Add flour when needed to prevent dough from really sticking and ripping apart. Cut out a circle by placing springform bottom on rolled out dough. Transfer the cutout dough onto spring form bottom with help of rolling pin. (HINT: the dough might tear a bit, but it’s an easy fix; just place pieces of dough and press to patch up). Bake for 10 minutes. (I have 3 forms and bake 2 at a time – a lot faster). Remove baked cake layers from forms right away. Stack them with parchment paper in between; let cool before adding cream. Use remaining cutouts to make another cake layer. I ALWAYS end up with 7, sometimes 8 cake layers. (These cake layers can stay up to a week at room temperature; you don’t have to cream right away). 5. 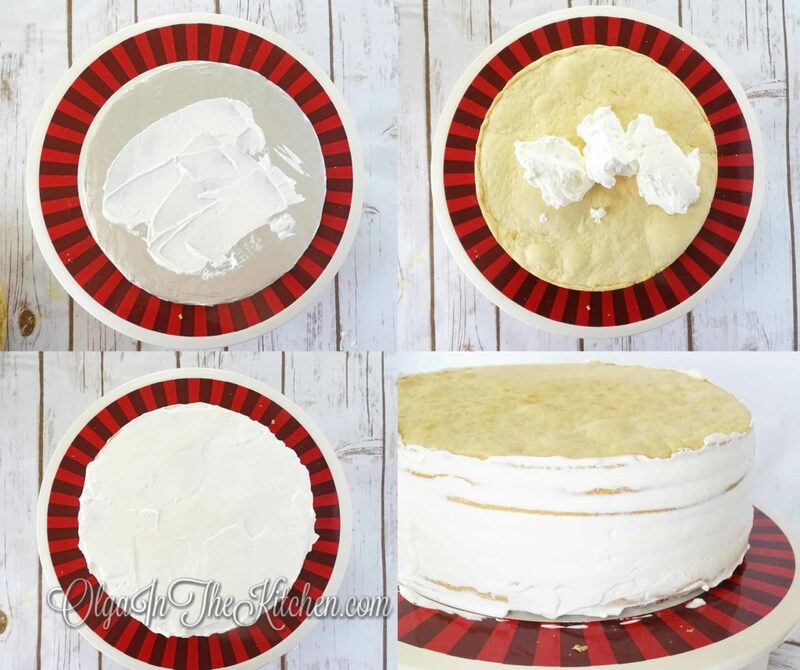 Cut out a cake size carton out of box and wrap it in foil. Stack cake layers before frosting, choosing the best looking (smooth) for the top. 6. 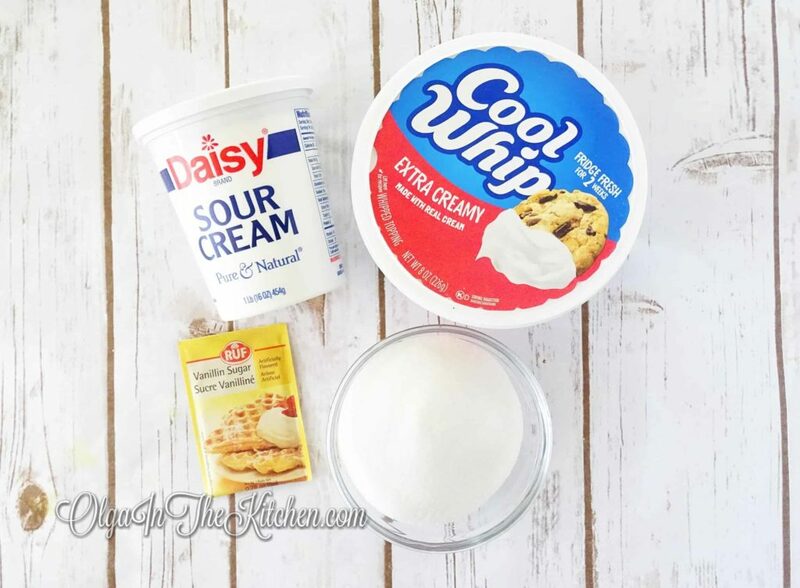 In a mixer bowl, combine all ingredients at once: 16 oz sour cream, 8 oz cool whip, 3/4 cup sugar and 1 pocket vanilla sugar. Beat on high for about 10 minutes until cream is fluffy and thick. 7. Spread little frosting on foil to keep cake from moving. Place first cake layer and spread about 3 tbsps sour cream frosting, covering edges (very important to get edges as this cake is dry and needs its cream to become moist). Continue with the rest cake layers until you get to the 7th layer. You can use sour cream for the top OR chocolate ganache. 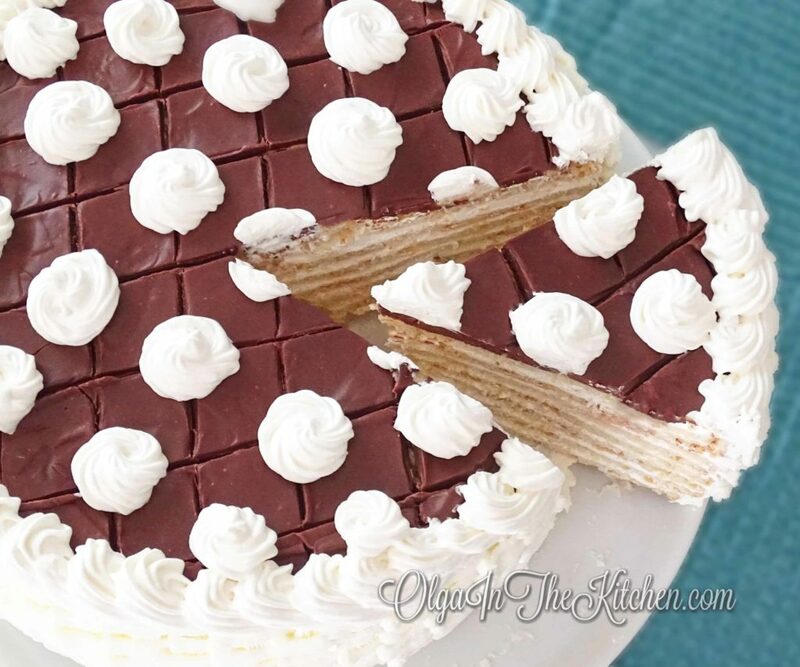 Let cake stand in room temp while you make the basket weave frosting. 8. In a medium bowl, beat 1 cup cold heavy whipping cream and 4 tbsps powdered sugar for about 2 mins until fluffy. Decorate cake sides with basket weave. 9. In a small sauce pan, bring 3.5-4 oz heavy whipping cream to steam, but not boil. Meanwhile break chocolate into pieces. 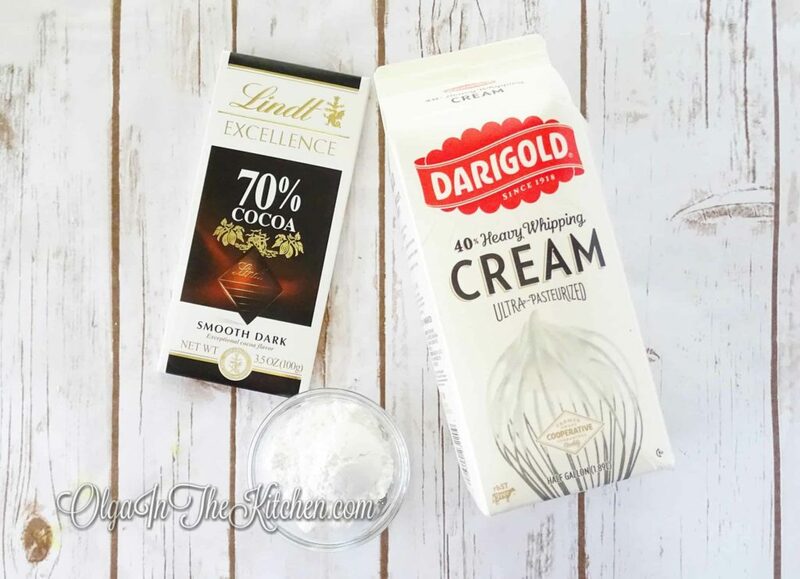 Pour hot cream over chocolate, let stand for about 1 minute and then whisk or stir until it becomes smooth chocolate ganache. Slowly pour the chocolate over the top cake layer in the center and spread with knife or spatula to the edges. Work fast as it will cool and dry. (You can do the top first and THEN the sides if you’re afraid that the ganache would go over cake sides. I always go in whenever order). Decorate top of ganache with remaining cream anyway you like. Refrigerate cake for at least 10-12 hours so it has time to absorb the cream and that the cake layers become moist. 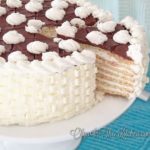 Ammonia White Cake with Sour Cream Frosting: dry cake layers creamed with sour cream frosting and topped with chocolate ganache. Preheat oven to 360°F. Lightly oil Springform Pan. In a small bowl, combine and stir 2 tbsps ammonia baking powder and 2 tbsps sour cream (leave other 2 tbsps. for later); set aside while you prep the other ingredients. It will become fluffy and a bit bubbly. (Ammonia baking powder usually has dried bubbles, press it with spoon to make it into smooth powder). Separate 4 eggs; refrigerate egg whites and use for other recipes or for breakfast. In a large bowl, combine and beat 4 egg yolks and 6 oz sugar for about 1 -1 ½ mins until sugar is dissolved. Add the ammonia baking powder mixture and remaining 2 tbsps sour cream to the egg batter. Beat for 1 minute on high. Start by sifting 1 cup all-purpose flour at a time into the batter, and start by beating on low so you don’t end up covered in flour. When batter starts to come together, continue mixing flour with your hands. I usually end up with 2 1/2 cups all-purpose flour while mixing and then the other 1/4 cup while rolling out each layer. It should represent a cookie dough: not sticky, but together. (Don’t make it extremely hard because you will add more flour when rolling each layer). 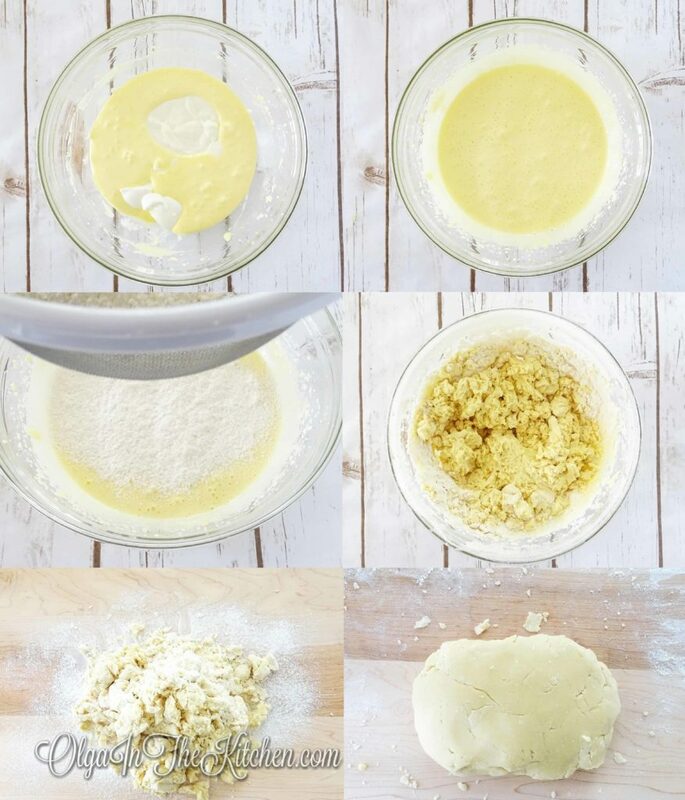 Cut dough into 6 equal pieces. Lightly flour work surface and roll out 1st dough piece to about 2 mm thickness. Add flour when needed to prevent dough from really sticking and ripping apart. Cut out a circle by placing springform bottom on rolled out dough. Transfer the cutout dough onto spring form bottom with help of rolling pin. (HINT: the dough might tear a bit, but it’s an easy fix; just place pieces of dough and press to patch up). Bake for 10 minutes. (I have 3 forms and bake 2 at a time – a lot faster). Remove baked cake layers from forms right away. Stack them with parchment paper in between; let cool before adding cream. Use remaining cutouts to make another cake layer. I ALWAYS end up with 7, sometimes 8 cake layers. (These cake layers can stay up to a week at room temperature; you don’t have to cream right away). Cut out a cake size carton out of box and wrap it in foil. Stack cake layers before frosting, choosing the best looking (smooth) for the top. 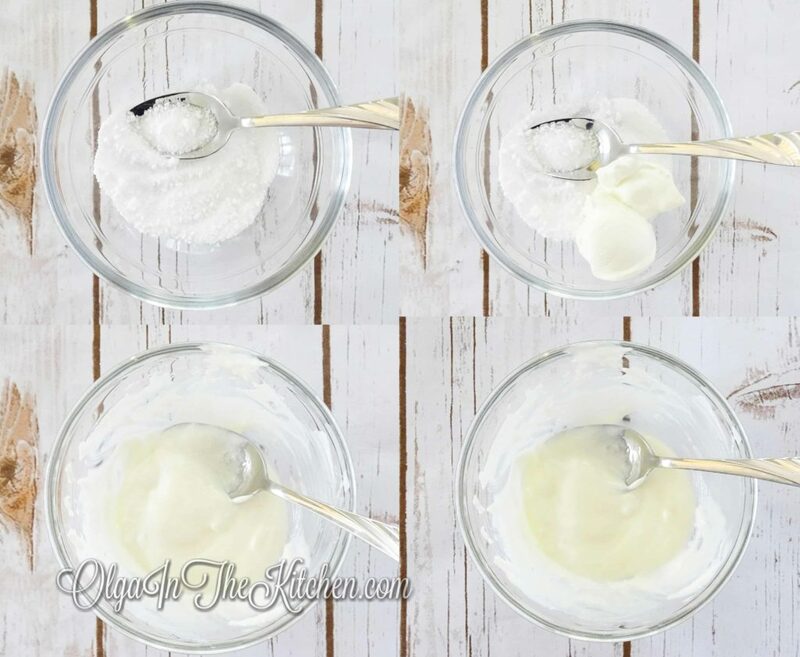 To make cream: In a mixer bowl, combine all ingredients at once: 16 oz sour cream, 8 oz cool whip, 3/4 cup sugar and 1 pocket vanilla sugar. Beat on high for about 10 minutes until cream is fluffy and thick. Spread little frosting on foil to keep cake from moving. Place first cake layer and spread about 3 tbsps sour cream frosting, covering edges (very important to get edges as this cake is dry and needs its cream to become moist). 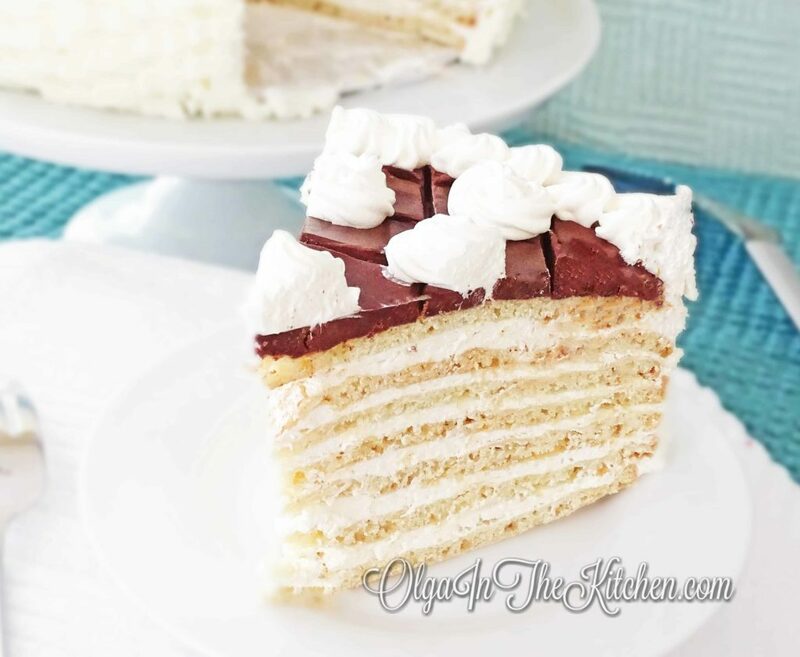 Continue with the rest cake layers until you get to the 7th layer. You can use sour cream for the top OR chocolate ganache. 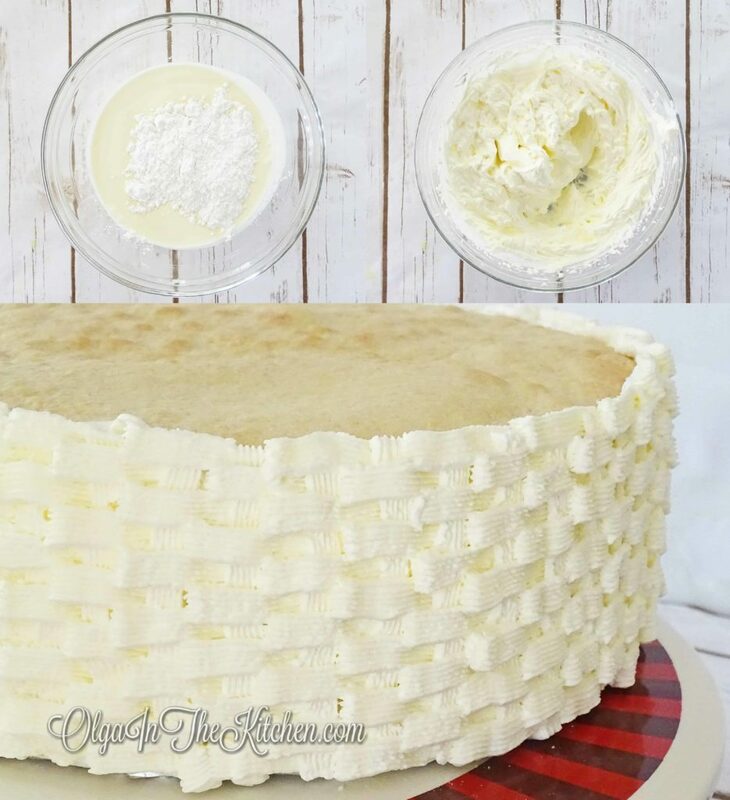 Let cake stand in room temp while you make the basket weave frosting. For Basket Weave: In a medium bowl, beat 1 cup cold heavy whipping cream and 4 tbsps powdered sugar for about 2 mins until fluffy. Decorate cake sides with basket weave. 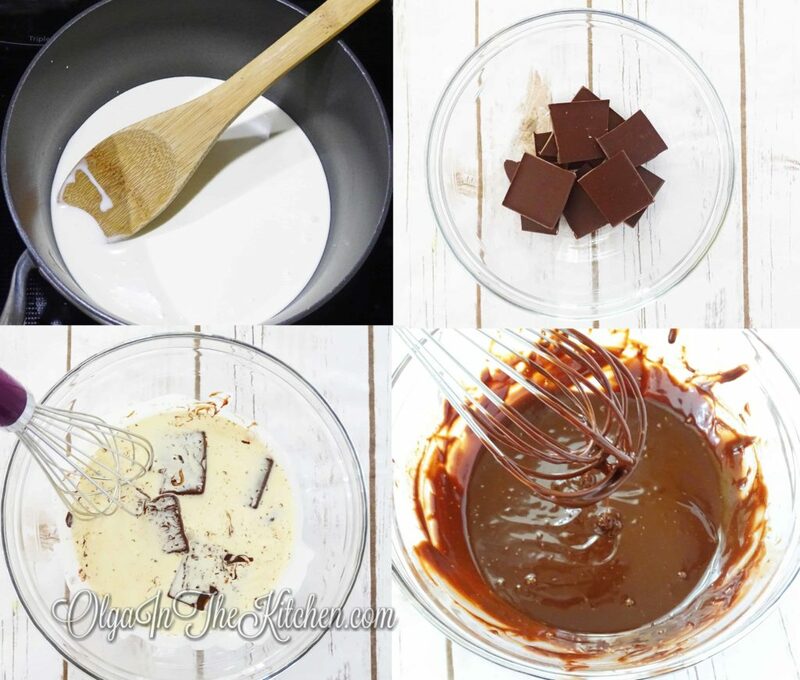 To make chocolate ganache: In a small sauce pan, bring 3.5-4 oz heavy whipping cream to steam, but not boil. Meanwhile break chocolate into pieces. Pour hot cream over chocolate, let stand for about 1 minute and then whisk or stir until it becomes smooth chocolate ganache. Slowly pour the chocolate over the top cake layer in the center and spread with knife or spatula to the edges. Work fast as it will cool and dry. (You can do the top first and THEN the sides if you’re afraid that the ganache would go over cake sides. I always go in whenever order). Decorate top of ganache with remaining cream anyway you like. 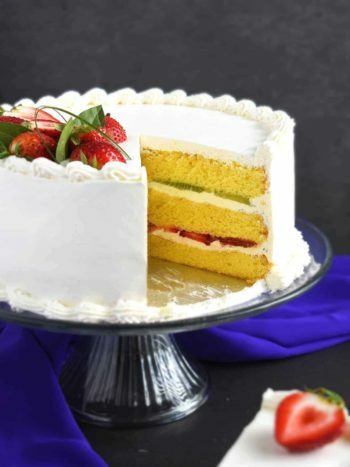 Refrigerate cake for at least 10-12 hours so it has time to absorb the cream and that the cake layers become moist. Enjoy! I’ve never heard about cakes with ammonia until I baked my own with your recipe. Wow! This cake is heavenly. 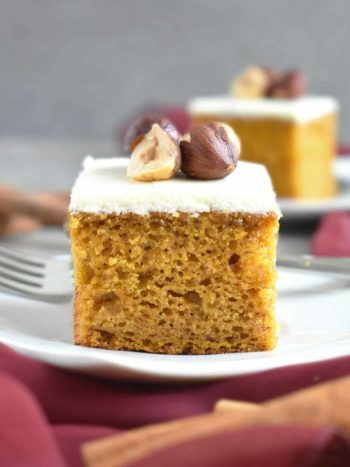 I noticed Ukrainian ladies have such a huge variety of cakes and each is tastier than the other 🙂 this cake definitely going into my recipe book, thank you!!! Thanks Sophia! Ammonia cakes were very popular especially back in the days in Ukraine. 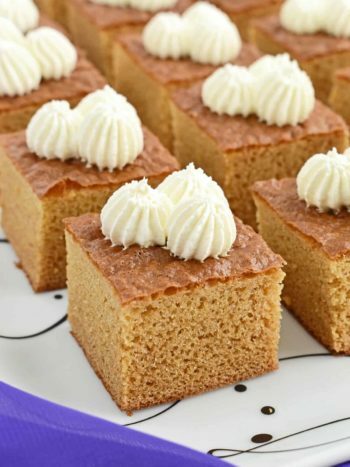 Nowadays everyone switched to sponge cakes, but it’s one of my favorites! ?